Meet the Smashbox collection of superstar products ~ all in portable travel sizes to give you a flawless face at home or on the go! 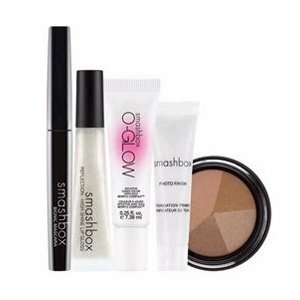 I am in love with all these products from the Smashbox TRY ME Vol.2 Superstars, especially the Photo Finish Primer & O-Glow. I bought this for about Rs.2430, which I think is not bad for 5 products. Since I've never tried any Smashbox stuff, I'm happy I got this coz I get to try a bunch of products all at once. I want to try O-glow so bad...please do a review on it. I have o-gloss, and love it quite too! Tht is a very good deal, where did u purchase this from? pretty!!!!! where this is available in india..??? Where did you buy it!! Whhhheeeere did you buy it.?! Please oh pleaaase tell me!